fabulous scooter ride with fellow Kung Fu friends Zeke and Leah! 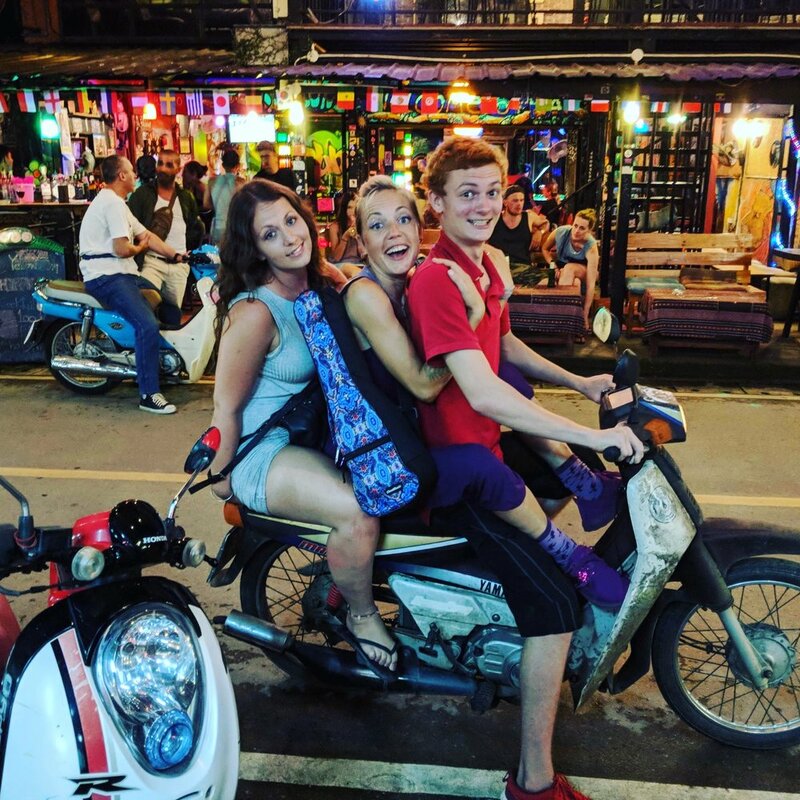 We are being so #thai here, the only thing we are missing to be truly #authenitc would be a dog and a baby on the phone added to the whizzing bike. Johhan arrived to Thailand's Nam Yang Retreat all the way from Estonia. I took him out to the infamous Pai Walking Street for dinner and a look around. We encountered this gem of a man busking on the street corner. 20baht later we are wearing hats and dancing joyfully. 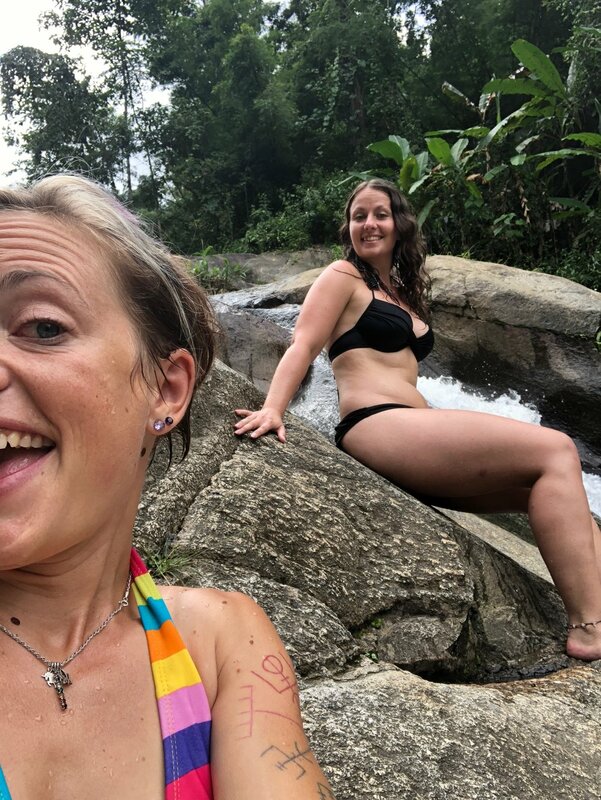 Sign up with your name and email address to receive news and updates from Jenifer Joy and her adventures in Thailand, teaching EFL and studying Kung Fu. Thank you! I look forward to sharing my adventures with you! Comments are always fun and I love' to stay in touch. Johhan and I coming back from lunch the next day and caught in a torrential 5 minute downpour scooter ride. 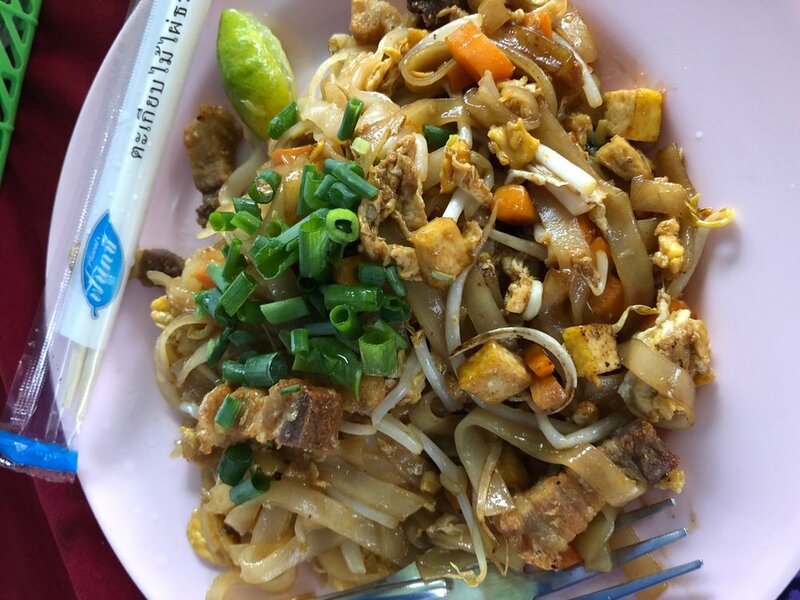 Here, I get to sample various #realpadthai - I often choose to get it either off the street cart, made fresh in front of me with real ingredients and a huge smile from the chef. Pad thai here is usually 30 baht, which is the equivalent to $1 at this time. Options are tofu, chicken or pork. I once had it with crispy pork (image included). I have found my favorite protein burger in Pai, off the lower end of walking street there is a Burger Queen, and for 100 baht (about $3.25), I get a real chicken breast fried up with cheese and bacon - #yumyum! I tried the "grunge burger" one evening (see pic of grill) - you may note there are a lot of spices on that paddy, and so the taste of blood and beef was not detected. 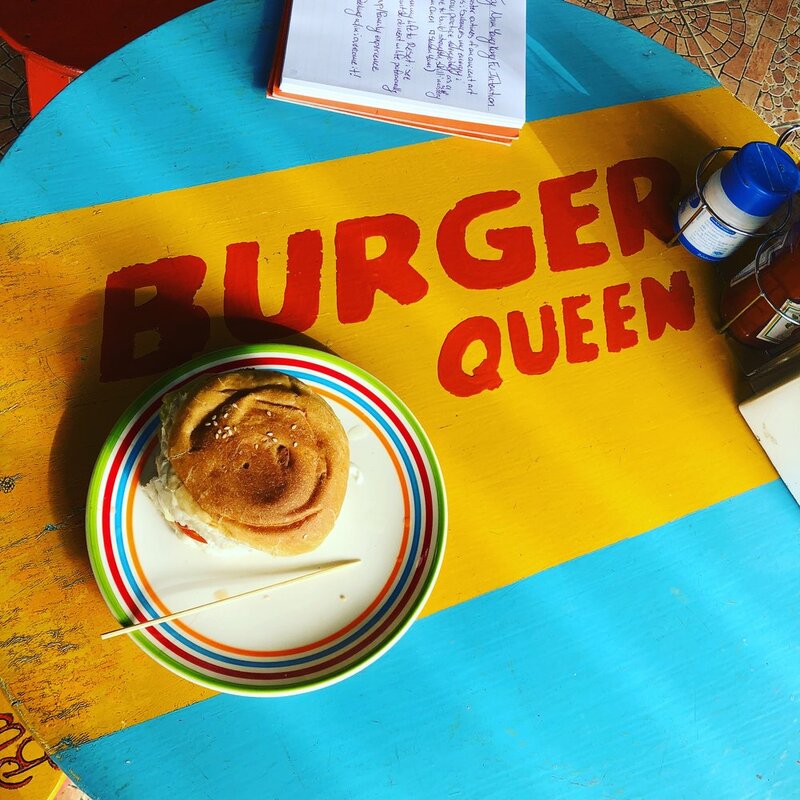 The other burger from Burger Queen was quite tasty and only 80 baht (about $2.50). I have been craving gummies and finally found these at the local 7-11 - lego style gummies, first you build, and then you eat! How I do love to play with my food :D And, to my surprise, I found #ebelskeevers! 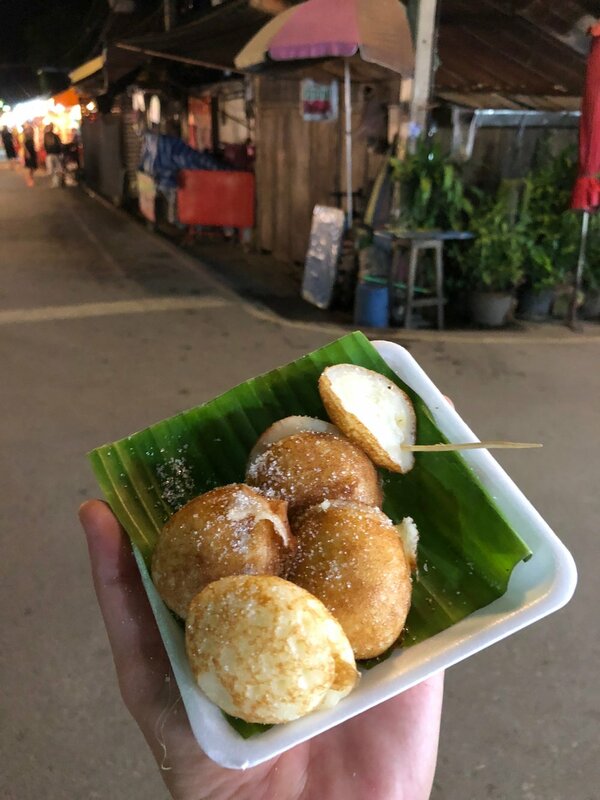 Round delicious pancakes, here served with sprinkle sugar (and no surprise inside, very untraditional for ebelskeevers). A gorgeous vegan salad with lots of yumminess and fresh dressing for my German friend Isabel. And, today's breakfast, french toast with baocn - again served up fresh by a silinng woman just 5 feet behind m table, filled with friends adn free wifi. An adventure with the Kung Fu gang to Pai waterfall, outside of Pai off a long upward bumpy road, to a hidden spot in the woods. Fresh Thai food available and lots of people from all around the world. Here you will see photos from the place plus some videos of our water time fun!